If you have been following my last few posts you will know that earlier this year we spent sometime in the Kgalagadi Transfrontier Park. The Kgalagadi is located in a dry arid savanna biome, plants and animal species that inhabit these arid biomes need to adapt to some of the very harsh conditions that prevail in these areas, one such animal species is the Gemsbok (Oryx gazella). We encountered many Gemsbok in the Kgalagadi, these magnificent large antelope stand when fully grown at about 1.2m to the shoulder and the adult bulls weighing in at over 300kg. You may think that an animal of this size would indeed struggle to inhabit and survive in what is basically a desert, which by definition is a dry area with very little rainfall and thus available water, often in drought and with extreme heat. 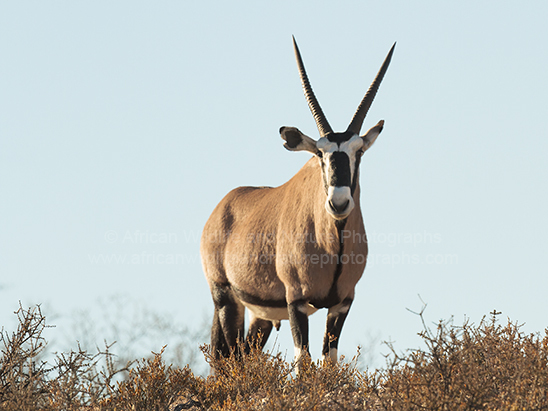 The Gemsbok (Oryx gazella) has evolved and adapted to not only survive in the dry arid areas but thrive in them. One of the most obviously adaptations to living in an area with very little water is to actually require very little water ones self. In this respect the Gemsbok takes most of its requirement of water from the food it eats. Grasses, roots which they dig up with their hooves, leafy bushes what ever can be found in these dry arid areas you will find Gemsbok close by grazing. Once of course you have taken on water by means of food and or have drunk some the next trick is to retain it, Gemsbok do not sweat and their deifications are dry. The Gemsbok also has a very distinctive pattern to its coat, continuing research provides us with evidence that the large light colours reflect heat and the dark colours absorb heat, for example one theory is that the large white patch on the belly of the Gemsbok actually reflects heat from the desert sands. To help with the extremes of heat Gemsbok have specialist physiological adaptations, one such adaptation is 'nasal panting', this is a kind of 'heat exchange' where Gemsbok rapidly inhale and exhale through their nose which is lined with small blood vessels called capillaries. Cool air is sucked in through the nose which cools the blood in these capillaries, in turn this cooled blood is circulated to the brain, where a fascinating part of anatomy is found called the 'hypothalamus' at the brains stem. The 'hypothalamus' oversees many internal body conditions and monitors chemical and physical characteristics of the blood, including body temperature, blood pressure and water content. Through this 'brain cooling action' Gemsbok can then regulate its body temperature by often allowing its temperature to rise considerably during the day and then gradually radiating any surplus heat away through its body as the day goes on and the temperatures cool. Simple other ploys such as standing with the smallest portions of its body to the sun and largest to any breeze also helps radiate heat away from the body.